Crime comedy starring Ginger Rogers. A publicity-seeking dancer takes the blame for a murder committed by her husband and hires an eccentric lawyer to prepare her defence. 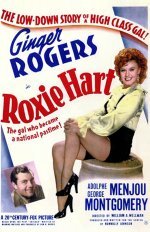 Terrifically hard-boiled and funny Ginger Rogers vehicle, based on Maurine Watkins's famous play Chicago, first filmed in 1928 with Phyllis Haver, and more famously, reworked by Bob Fosse as a stunning Broadway musical under the original title - now a major Hollywood film starring Catherine Zeta-Jones and Renée Zellweger. This is 20th Century-Fox in the 1940s near its best: there's a crackling script (written by the film's producer Nunnally Johnson), a magnificent picture-stealing performance from Adolphe Menjou, and some super by-play from the supporting cast watch especially for the ever put-upon George Chandler. Rogers simply scintillates as the on-trial heroine of the title, and, if William A Wellman's direction isn't quite spot-on (if ever a movie needed Howard Hawks, it was this one), or if George Montgomery is a colourless leading man, it doesn't really matter. By now Roxie art should have achieved minor classic status, and is always a treat to watch.